A troubled young woman working as a nighttime security guard discovers a terrifying connection between an abandoned building and a haunted past. Nursing student Julia Streak takes a night shift job as a security guard in an abandoned luxury apartment building that was never completed. Dixon Boothe shows Julia around the property before introducing her to her partner Dennis Cooper. Julia is assigned to patrol the building once every two hours while Dennis monitors the surveillance cameras. Presuming she will be just another washout, Cooper takes an initial dislike to Julia. Cooper initiates Julia by turning off the power while she rides the elevator. Julia has a bout of claustrophobia while trapped and hears children’s voices whispering to her. She later sees a bloody vision while gazing into a mirror and finds a dead rat during her rounds. Back in the control room, Julia and Cooper bond slightly while mentioning their respective daughters. Due to ongoing psychological issues, Julia is under threat of her daughter Clara being taken away if she cannot set her life straight. Julia asks about area 441, which has a downed surveillance camera. Cooper informs Julia that 441 is part of an off limits area where cameras are not on because it is closed. Julia decides to reset the circuit breaker for the camera and explore the area anyway. While downstairs, Julia hears knocking noises from the other side of a metal door leading to an underground shelter. A derelict named Jim attempts to seek refuge from the storm outside. Cooper is revealed to be in a wheelchair. Despite Cooper’s insistence that Jim be turned away, Julia allows the homeless man inside provided he stays in a single room to sleep and does not wander the premises. While Cooper drinks beer and falls asleep, Julia uses a hammer to break the lock on the metal door and explores the tunnel leading to the cavernous shelter. The surveillance camera moves towards the ceiling on its own to prevent Cooper from monitoring her. Jim sneaks out of his room with his dog and secretly follows behind Julia. Julia realizes that the area previously housed a children’s dormitory of some sort when she finds crayon drawings, chalk markings, and a discarded doll. Julia has a brief vision of a child huddled in a corner on one of the rusted hospital beds. Cooper returns to the surveillance station and sees that the shelter door has been locked behind Julia. Julia has a frightening flash of a mongoloid boy before Cooper comes to her rescue. Together, they begin searching for Jim, as Cooper suspects he is the one who locked Julia inside the tunnel. Meanwhile, Jim is supernaturally slaughtered by a child’s ghost while washing his hands in a bathroom. Back at the monitoring station, Julia researches the building and finds a news exposé uncovering abuse and neglect of child patients by Dr. Thorndike and his staff at a hospital once housed on the property. Julia tells Cooper that they need to shut the shelter door in order to seal in the spirits of the children. Cooper believes Julia is delusional and reveals that he discovered her anti-psychotic medication. Julia insists that she is merely sensitive to spiritual phenomenon and only takes meds to placate her doctor and ensure she keeps custody of her daughter. Julia pulls her stun gun on Cooper and repeats her insistence on closing the shelter door. Cooper agrees to do it himself, but handcuffs Julia to the desk before leaving. Cooper becomes briefly stuck in the elevator on his way downstairs. Observing Cooper on camera, Julia sees ghost children stalking him. When Cooper goes to shut the shelter door, spirits take control of his wheelchair and force him inside the tunnel. Ghosts continue manipulating him supernaturally as the power goes out on the surveillance system. Julia reaches a fire ax and breaks her handcuff chain. Julia runs downstairs and finds Jim’s body. The ghost of a little boy tells Julia that the children will not let her leave because they do not like grownups. The ghost boy shows Julia visions of the horrors that took place in the hospital. Julia follows the visions to a water pool. The boy explains that the grownups used to lock the children in the poolroom to keep them quiet and the children died from drinking the tainted water. He then mentions that one child survived. Julia sees a familiar face drowning in the water and prepares to dive in. Cooper enters and tries protesting that the vision is not who Julia thinks it is. Julia jumps in the pool anyway. Cooper pulls Julia out before he is pulled underwater himself. As paranormal activity causes furniture to fly, Julia attempts an escape. Unable to open the door, Julia confronts a deformed little girl. Julia embraces the girl, tells her it is not her fault, and then says, “I love you just the way you are.” The children then allow Julia to leave and she escapes the building. Julia dies in a hospital bed. She is revealed to have been in a coma while hallucinating everything that happened in the building. In actuality, Julia was the deformed girl. Cooper was her father, Dixon was her doctor, and Clara was the name of the doll found while exploring the shelter. Jim is shown to have been another hospital patient sitting outside Julia’s room. NOTE: "The Abandoned" was previously titled "The Confines." For Julia Streak, a graveyard shift gig may be her last chance at redemption. Unspecified skeletons in Julia’s closet have earned the troubled nursing student a prescription for antipsychotics and a threat that her daughter might go away for good if she cannot straighten out. So it is that Streak finds her nightlife temporarily repurposed as a rookie security guard on a two-person patrol team tasked with ensuring an abandoned building of behemoth proportions remains unoccupied. While Streak makes her rounds, charmingly contemptible Cooper keeps an eye on the cameras in his comfy surveillance suite. Once intended for servicing luxury lifestyles, the unfinished structure they steward now rivals The Bramford as New York’s most ominously imposing housing complex. Whether the whispered voices are coming from her head or from cobwebbed shadows, curiosity compels Streak to spelunk the cavernous catacombs beneath the building. What she discovers in those depths disturbs a sinister secret that quickly turns her job’s first night into a nightmare for her and Cooper both. For his directorial debut, Eytan Rockaway sticks to a template of tried-and-true tactics to make a competently crafted slow-creep chiller, albeit one that would benefit from a more original edge. 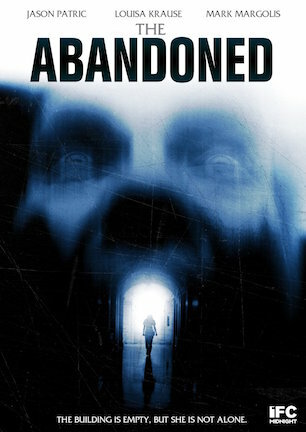 While the atmosphere is thick with supernatural suspense, “The Abandoned” does not include a single fright that is unaccompanied by an audio-spiking “boo!” to ensure no one misses the jump cue. Such moments do their job of delivering rubber mallets to the knee, but anyone eager for a heartier swig of horror will thirst for more substance to the scares. There is some substance to the story, however. Rockaway’s movie is a metaphor for how humans confront imperfections by imprisoning themselves within skewed self-perceptions. To more literally illustrate that idea, Ido Fluk’s script cribs from the real-life horror story of Staten Island’s Willowbrook State School, going so far as to use what looks like actual footage from Geraldo Rivera’s infamous 1972 exposé. Ghosts in room corners and bloody reflections in mirrors only hint at the cruel mystery Streak and Cooper have on their hands, which runs deeper still when they uncover unexpected personal connections to the fearsome facility’s shamefully haunted history. Before arriving at its twist, “The Abandoned” has to cruise through contrivances laying overly familiar foundations. Act one features the kind of information-heavy dialogue existing for exposition alone, including lines like “this is your last chance or they’re going to take (your daughter) away” and “we lose electricity from time to time” to telegraph an inevitable power outage timed at a conveniently climactic moment. Realizing that its primarily two-person narrative needs someone to suffer who isn’t a lead, Mark Margolis is added as a mumbling derelict whose only real plot purpose is to be killed, a fact highlighted by the final pre-credits shot of the insignificant part he actually plays in the psychodrama powering the mystery. As beleaguered by typical terror tropes as “The Abandoned” is, the film stays buoyed by captivating co-starring performances. “Ava’s Possessions” (review here) actress Louisa Krause builds a street smart sheen on top of fractured emotional fragility, turning an initially simply-sketched stereotype into an accessibly sympathetic heroine. Without Jason Patric as the other anchor, Cooper’s uneasy sleaze would be off-putting and outdated as a misogynist not worth an attachment. Patric’s presence has a casual charisma that makes Cooper unlikely likable as more misunderstood than miscreant. Lose either end of the Krause-Patric battery and “The Abandoned” would never hold its charge. The secret behind the story has trouble retroactively making all previous puzzle pieces fit snugly. Once “The Abandoned” pulls back the curtain on its “ta-da!” reveal, look back at Cooper’s unwanted sexual advances on Streak to see another level of disturbing for an example. Yet credit is deserved for at least making a clever attempt at instilling intrigue, regardless of how late it arrives. No letter addressed to mom will ever mention “The Abandoned,” though it is hard to find fault with a first-time genre filmmaker keeping ambitions achievable and meeting the mark, even if no molds are broken in the process. “The Abandoned” lands as an above-average thriller whose peaks of pitched performances and artificially effective jolts are as high as its straightforward scares and standard story valleys are low. June 24, 2015 by Ian Sedensky.